It seems like the war between Bitcoiners and one of the world’s most famous companies, the mighty Apple, has come to an end. Or at least an intermission. The tech giant quietly changed its terms of service for developers after the most recent Apple Worldwide Developer Conference (WWDC), but the developers noticed the huge novelty. The re-written section 11.17 now states that “apps may facilitate transmission of approved virtual currencies provided that they do so in compliance with all state and federal laws for the territories in which the app functions”. 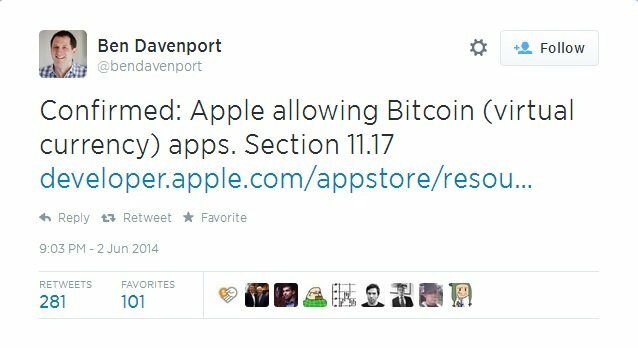 In other words, Apple will stop banning legal and compliant Bitcoin apps from its online App Store just because they are connected to cryptocurrency. One of the first Bitcoiners to notice the change was the angel investor Ben Davenport, who twitted an announcement a few hours ago. BitGo’s CPO simply wrote “Confirmed: Apple allowing Bitcoin (virtual currency) apps”. The long list of Bitcoin-related applications banned so far from the online platform includes the world’s most popular digital wallet, Blockchain, among many others. Apple’s previous decisions regarding these apps – especially the exclusion of Blockchain’s app from its online store – led to a string of protests that became viral on YouTube and across other social networks. Several Bitcoiners ended up smashing their iPhones and filming the moment to show Apple their dissatisfaction. At the time, Blockchain released a statement saying that “these actions by Apple once again demonstrate the anti­-competitive and capricious nature of the App Store policies that are clearly focused on preserving Apple’s monopoly on payments rather than based on any consideration of the needs and desires of their users”.